This succulent cheesecake will delight your palate with its rich chocolate and strawberry flavor. At less than 3 points per cheesecake, it's a wonderful and flavorful dessert you can enjoy time and time again. Preheat oven to 350 degrees. Spray Pam cooking spray in 12 muffin tins. Beat cream cheese with sugar until well blended. Beat in egg, melted chocolate, yogurt, and cocoa. 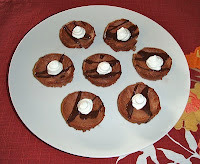 Spoon batter in muffin tins and bake about 25 minutes or until set. Cool on rack and refrigerate overnight. Remove carefully, add a dollop of cool whip, and enjoy. 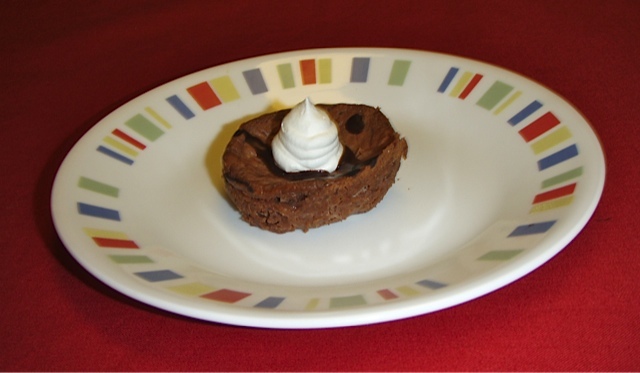 (I added a little bit of sugar-free chocolate syrup on top, before adding the cool whip.) Note: These tend to stick to the pan if not sprayed well with Pam cooking spray. This happened to me and made me think the next time I try this I might line each muffin tin with parchment paper sprayed with Pam and then spoon in mixture before refrigerating. If you'd like a printer-friendly version of this recipe, Click Here.